So it's important to settle for a good financial advisorplanner when you start your investments to meet various financial Goals in life. Selecting the right person who will handhold one through his financial journey is one of the most important decisions one can make in life. A financial planner should understand your requirement for a financial plan and then put in place a plan based on your needs. He should then help you invest in products which are suitable for your financial Goals, educate you, help you with the execution part and then should also review your plan so that in case the investments veer off the predefined path, he should help you bring it back on track. If you belong to the salaried class then Systematic Investment Plans (SIPs) are one of the best financial innovations for you. Here one can pay regularly (monthly or quarterly) and as per one's choice and convenience in any chosen scheme (Equity, Debt andor balance funds) even with an amount as small as Rs 500. SIP inculcates in an investor a disciplined approach to investing, helps in rupee-cost averaging, assists one to take advantage of compounding if the SIP is run for a long period of time. To address the financial needs at every stage of life, one needs to address those needs separately. Depending on the choice and needs of an individual, these stages could include getting married, buying a house, children's education, vacations, children's marriage, retirement of the self and emergency funds. For each stage of the life, one can set up an SIP in an appropriate type of mutual fund scheme and make his money work better for reaching these Goals. 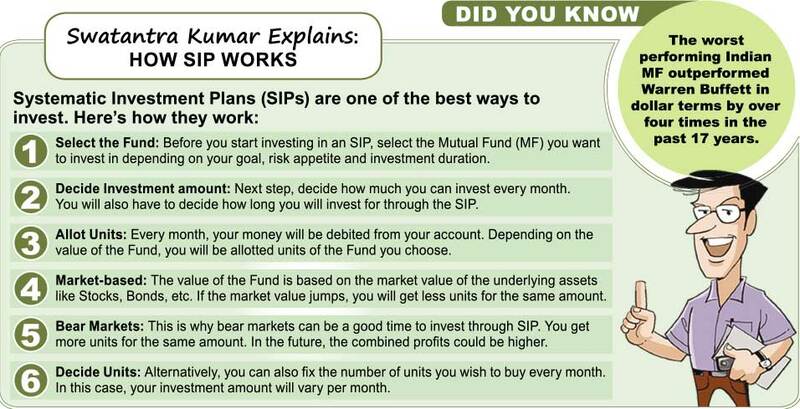 Here the basic rule of setting up an SIP is to look at the time left to reach the respective Goal.If the time left to reach a particular Goal is say a few months to a few years, that is about 2-3 years, this is classified as a short term Goal. Paying children's school fees, insurance premium, short vacations etc. could be categorised into such short term Goals. For such Goals starting an SIP in a Debt fund or a Liquid Fund is the ideal way to go. For Goals which are say between 4-6 years or so, such Goals could be categorised as medium term Goals. For example one is planning a foreign vacation after five years from now. Or one's child is set to go for higher studies in about four years from now. For these Goals one could set up an SIP in a balanced fund. The third category is the long term Goals. These Goals are say more than seven years in fu ture. Such Goals could include building a retirement corpus, children's marriage etc. The thumb rule for meeting a long term financial Goal is to set up an SIP in an Equity scheme. While we speak of how to make your invest ment, it would also be wise to think of ways of avoiding mistakes while doing so. According to financial planners, there are major areas where retail investors err while planning their investments. Firstly, when investment decisions are taken based on emotions and not logic.Secondly, investments are made under peer pressure. And thirdly, a large number of investors have this notion that a simple investment solution cannot be the best solution and they look for complex solutions even if the final outcome is barely different. Common mistakes also include get ting carried away by emotions like in vesting a large portion of money in one asset class if it has performed well in the past. Other mistakes in clude getting influenced by the herd mentality, setting up a complex port folio rather than a simple one, invest ing purely for saving taxes and not keeping a time frame while investing. Though ideally tax planning should be a year-long affair that should start at the begin ning of the financial year, most people think of their tax planning only in the last few months of the year. ELSS (also called Tax Saving mutual funds) floated by fund houses are one of the best Tax Saving options for investors. This is because in the long term they have the potential to generate an average annual return of 12% or more, these funds help a taxpayer save on taxes under income tax rules and has a lock-in of just three years as compared to Tax Saving instruments which has a lock-ins of five years or more. The returns from all ELSS are also tax free while the costs are rarely more than 2.5% per annum, one of the lowest for comparable products.